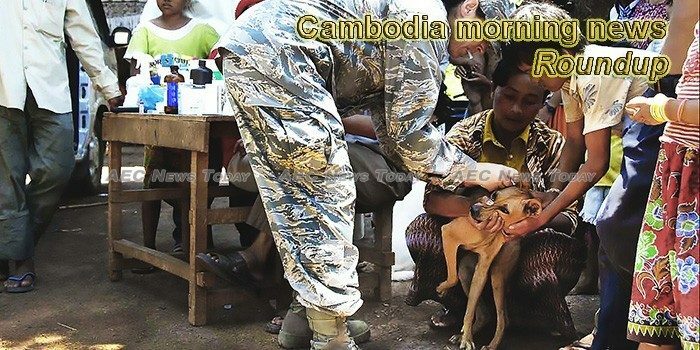 The Cambodian Mine Action and Victim Assistance Authority has estimated that the number of mine casualties has increased in the first eight months of this year when compared to the same period last year. As questions continue to be raised over the Cambodian government’s legitimacy following the landslide victory of the ruling Cambodian People’s Party in July’s election, Prime Minister Hun Sen is expected to be met by protests when he attends a United Nations summit on Thursday in New York. Cambodians threw rice on the ground on Tuesday to mark the ‘Festival of the Dead’ or Pchum Ben and feed the spirits of the dead. Former Cambodia National Rescue Party (CNRP) official Meach Sovannara was joined by supporters at a rally in California on Saturday, where a US lawmaker hailed members of the outlawed opposition as “great freedom fighters”. The Bar Association of the Kingdom of Cambodia has unveiled an ongoing project to build consultation rooms at prisons across the Kingdom in a move welcomed by civil society organisations. Fashion group H&M was failing to keep a “living wage” promise, forcing many employees in its factories to work excessive hours to survive, civil society groups said on Monday. The Kingdom’s insurance industry has enjoyed rapid growth in recent years, a trend that has been enhanced by partnerships with mobile network operators. Prime minister Hun Sen on Monday said he has forgiven those responsible for an attempt on his life 20 years ago, using the anniversary to further express his determination to prevent any “coup” or “colour revolution” from taking place in Cambodia. In Cambodia’s Koh Kong and Sihanoukville Provinces, the UN Development Programme (UNDP) and NGO People in Need are preparing to extend an early warning system using SMS-based technology linked with data from recently installed automatic weather and hydrological stations, and the existing platform of EWS1294. Washington state lawmakers should not be lending a false veneer of respectability to Cambodia’s recent national election, which most outside observers have decried as a sham. The Environment Ministry will set up Cambodia’s first orchid research and conservation centre in Siem Reap province next month, a ministry spokesman said yesterday. Multidimensional poverty continued to fall, but around 35 percent of all Cambodians remained poor, the United Nations Development Program (UNDP) in Cambodia said in a press release on Tuesday. Last Friday, Heifer International Cambodia and the Khmer Organic Cooperative signed a collaboration agreement that will give 35,000 smallholder farmers in 64 agricultural communities greater market access and boost the price of their products. The Culture and Fine Arts Ministry has signed a Memorandum of Understanding with Unesco to repair parts of the Bayon temple using aid from the Japanese government over a three-year period. Brad Glosserman, Pacific Forum CSIS senior adviser, last week said the Cambodian government has to put more effort in rebuilding its relationship with the United States. Daniel Schmücking, head of Konrad-Adenauer-Stiftung, said yesterday that civic education plays a crucial role when it comes to democracy. That same evening we were announced the winner of the 5G Asia People’s Choice Award for Operator CxO of the Year. It’s a great honour to win and it’s a credit to all our Cellcard team. Cambodia’s remarkable progress today could not be achieved without China’s help and support, Cambodian Deputy Prime Minister Hor Namhong said here on Tuesday. Cambodia-China, the iron-clad friends, pledged to hold bigger Golden Dragon Military Exercise in 2019, yet the time and venue to be determined, according to Ith Sarath, deputy commander of the Royal Cambodian Armed Forces and chairman of the Joint Chiefs of Staff. Cambodian Prime Minister Hun Sen will lead a senior delegation to attend the 73rd Session of the UN General Assembly 2018-2019 to be held in New York. U.S.-Cambodia: Philadelphia Municipal Court Judge Welcomes Cambodian General Hun Manet’s Visit to U.S.
Philadelphia Municipal Court Judge JAMES M DeLEON sent a welcoming letter to Cambodian General Hun Manet to the City of Philadelphia in the Commonwealth of Pennsylvania.